Majority of our sales are done through custom butchering. This sales method helps us focus on farming and keeps the butchering and packing costs down. 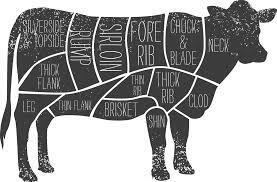 Please fill out the cutting instructions to place your order for 1/4 or side of beef. *Prices and weights for both sides and quarters are based on hanging weight, and include cutting, wrapping and freezing. Take home weights are approximately 20-30% less than hanging weight due to trimming and deboning. Notes: When purchasing quarters/sides you choose all your own cuts . A quarter beef from our Lynch Lineback cows is approximately 100lbs hanging weight and the price reflects the extra time that is required to raise the animals on 100% grass. The Lynch Lineback breed is smaller than the typical beef cows so a quarter beef is a manageable amount for your freezer. The quarters are actually a split side, with cuts from both the front and hind parts of the animal that the butcher divides by equal value. This year beef will be available July and October. This form is simplified to give customers the basic options. But if you know what you want and it is not on the form please feel free to make use of the notes section or leave a note for the butcher to call you and you can speak with them directly. The butcher dates will be confirmed a few weeks before the actual day, you will get a reminder email that they are booked in and an idea of when your beef will be ready to pick-up (approx four weeks later). Would you like any stewing beef?